When spring comes to the Arctic, both snow and ice melt, forming melt ponds on the surface of the sea ice. As the climate continues to warm, the number and size of these melt ponds is increasing. 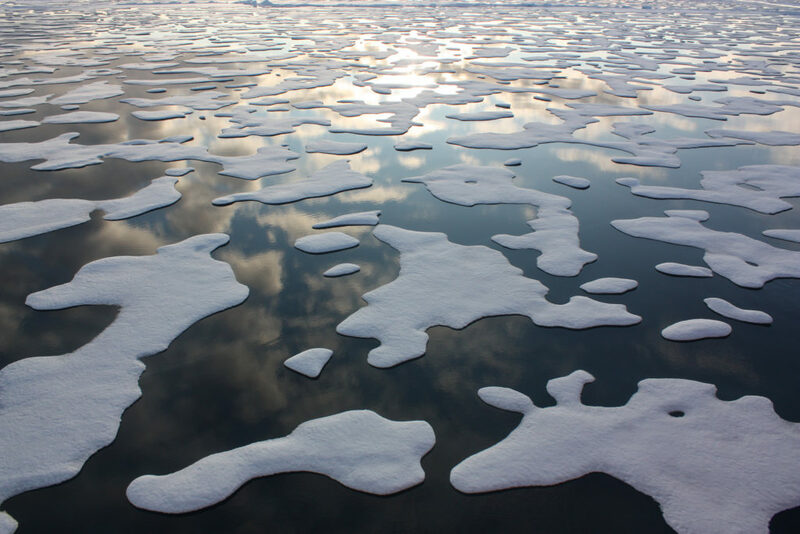 Melt ponds provide more light and heat for the ice and underlying water, leading to even more ice melt in the arctic, but it also turns out that the increasing melt ponds directly affects the life in the Arctic waters. Mats of algae and bacteria evolve in these melt ponds, originally carried there from waves of sea water or transported by dust storms and rain storms. These mats provide food for marine creatures when the algae and bacteria get released into the surrounding seawater. Some is immediately ingested by creatures high up in the water column; other food sinks to the bottom and gets eaten by seabed dwellers. The upper part of the water column mostly feeds krill and copepods. These in turn are eaten by various larger animals, ranging from amphipods to fish, seals and whales. Down at the bottom, sea cucumbers and brittle stars feed on the algae that sinks down. With the increasing number and size of melt ponds, more and more food is being released into the polar sea. With more storms and more precipitation in the Arctic, we should expect that more nutrients will be released and this will lead to increased productivity in plant and animal life in the Arctic. Photo, posted July 20, 2011, courtesy of NASA Goddard Space Flight Center via Flickr. ‘Melting Ice Adds Life to the Sea’ from Earth Wise is a production of WAMC Northeast Public Radio.